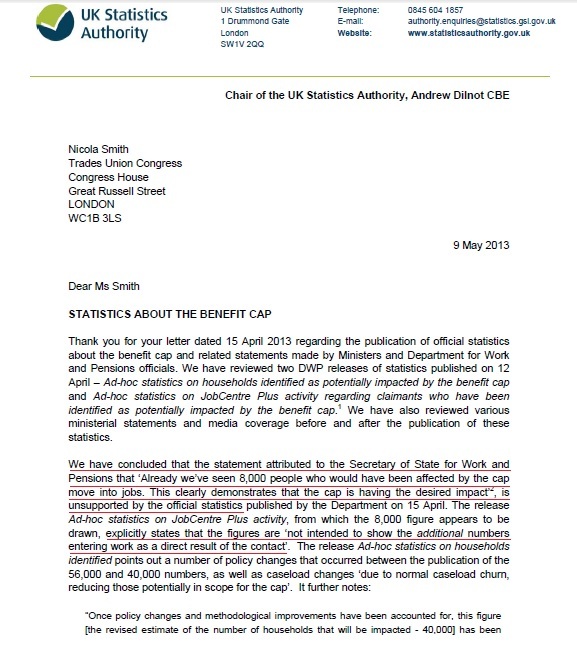 The UK Statistics Authority (UKSA) has issued a new rebuke to the Department of Work and Pensions (DWP) for its abuse of statistics to misrepresent the effects of its benefits cap in forcing people into work. The UKSA also issued a letter to the Trades Union Congress (TUC) outlining its findings. These documents are as emphatically damning as the official language of such letters can make them. But they address what is far from the worst government abuse – of statistics and of the people the numbers represent. As I showed last month, the government has falsely claimed that benefit ‘reforms’ caused almost 900,000 people to abandon their claims for Employment Support Allowance (ESA) rather than face a medical assessment, to make it appear that a huge number of claims were false and people suddenly decided to stop claiming all at once. 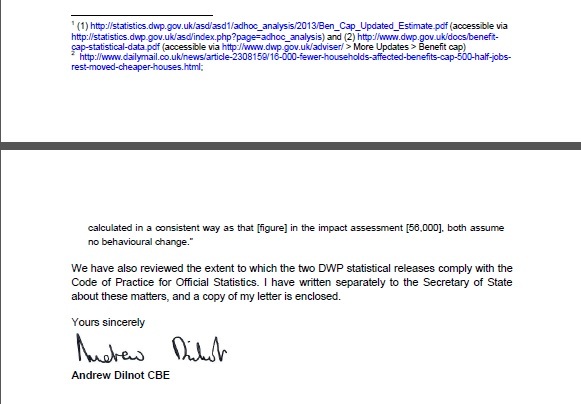 In fact, the government was adding up the normal monthly ‘churn’ or ‘off-flow’ of 18-20,000 people whose claims end before the very lengthy assessment process is complete – because they got better, found work even if they were still ill, or just decided they no longer needed to complain. These figures have been constant for years – adding them is nonsense – and using them to represent some sudden flood of abandoned claims is nothing more than a lie. 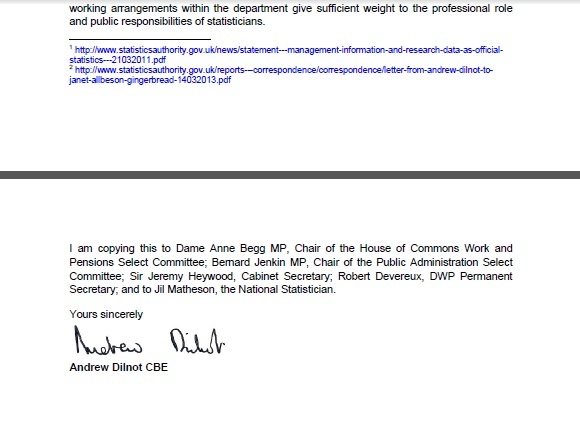 I read with interest your censure of the DWP for misuse of statistics relating to people returning to work because of the supposed effects of the benefit cap. The abuse of these statistics to wrongly demonise ESA claimants as skivers and to justify the government’s further targeting of disabled people, is utterly unacceptable and I would appreciate your organisation taking a close look at the matter and issuing its assessment. 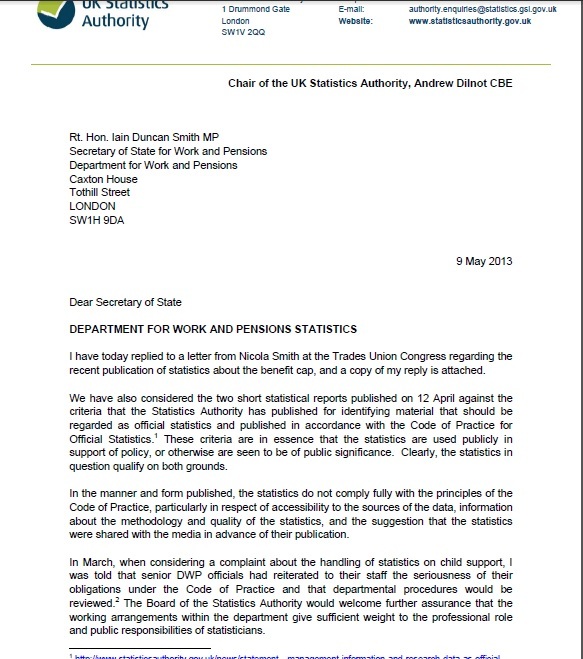 Can I ask you to do the same, to make sure that the UKSA’s attention is properly drawn to this malignant abuse of statistics and that the government is properly ‘spanked’ again? Following the Vox Political article on Iain Duncan Smith misleading everybody with false figures, Skwawkbox puts meat on the bones. Here are the damning details. Read, enjoy, share with your friends – and then sign the petition to make him account for himself. Absolutely! Could you provide a source for that and I’ll add it to the article. It shows the old saying is right. Why let the truth get in the way of a good storey?